This was another week of more fun doing poetry with students. At this point in their work students have started to look at the poems they like the most for their anthology, focus on a topic, and looking at different ways of exploring the topic. One day this week we had students bring an artifact that they thought was special so that they could play with emotions in poetry. My CT and I made our own poems to demonstrate, and we shared a picture as well. Mine was of my daughter playing inside of a train statue. The first week back at my MP I was able to do some practice teaching two mini lessons. Both were read alouds one was a persuasive letters and the other was about the power of persuasive writing. The first was an article called “Elimina comida basura.” The second was a short article about Jane Goodall and the many letters she wrote in defense of animals and the environment. It was a great experience to have my first week back. Teaching two mini lessons gave me some idea of how one lesson builds on another. I also really appreciated working with my CT side by side because I knew that if I needed help she would jump right in. It felt good just to teach. For each read aloud I was able to elicit student thinking and with help from my CT write students thinking. Some of the challenge for me the first day was definitely using my teacher voice while also transitioning from recess to Lectura Persuasiva. 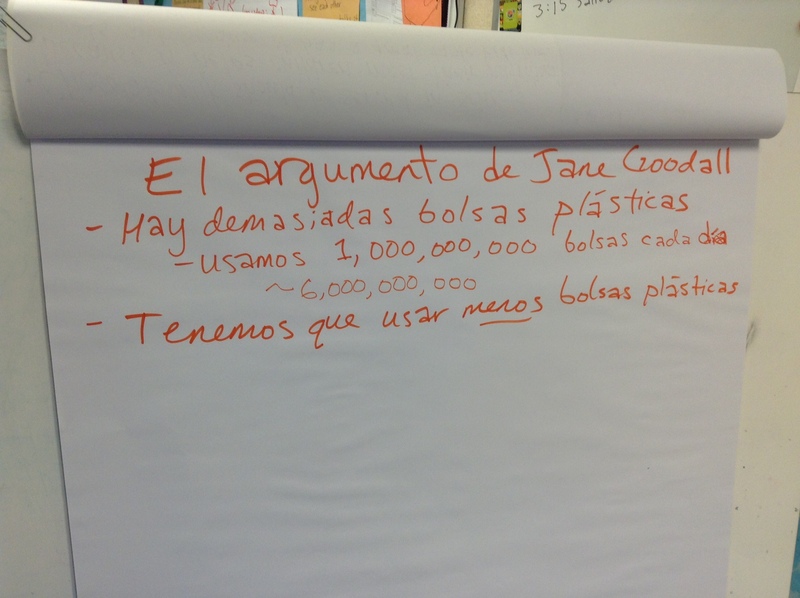 Also while planning the read alouds, I debated what were good stopping points and turn and talk. It turned out that what benefited the students the most was stopping and doing turn and talk, when key points were made. Letting students discuss among themselves lent itself to figuring out the meaning of words on their own. I did not have to stop and explain every new word that they were reading. The students figured it out on their own using the context of the writing, with the help of each other and the class discussion. I also did a lot of thinking out loud, while I read I highlighted on the smart board some of the ideas that stood out to me and let students discuss. It is all still rough but is work in progress. This week I co-taught a lesson with my Dyad partner on Academic Conversation to three blocks of 8th graders. It was a very interesting and helpful experience. We worked really hard to plan out the lesson and we thought about mostly everything. At least that is what we thought until we taught it. We decided that for two blocks we would each have a bigger part to take over. For the first block I lead the conversation the second time my partners did it. By the third time we figured what we each did best and co-taught the lesson. Having the opportunity to observe and listen to each other was very valuable. By the end of the experience I learned that my level of enthusiasm for the topic we teach is supper important. I was definitely not into H.P. Lovecraft’s dark style of writing or our other choice Edgar Allen Poe. Among the things that we did not plan for was that students would read the poem completely wrong and make the story more evil than it really was. Also we did not think about the chaos it would be to have 8th graders sit in a circle for academic conversation. 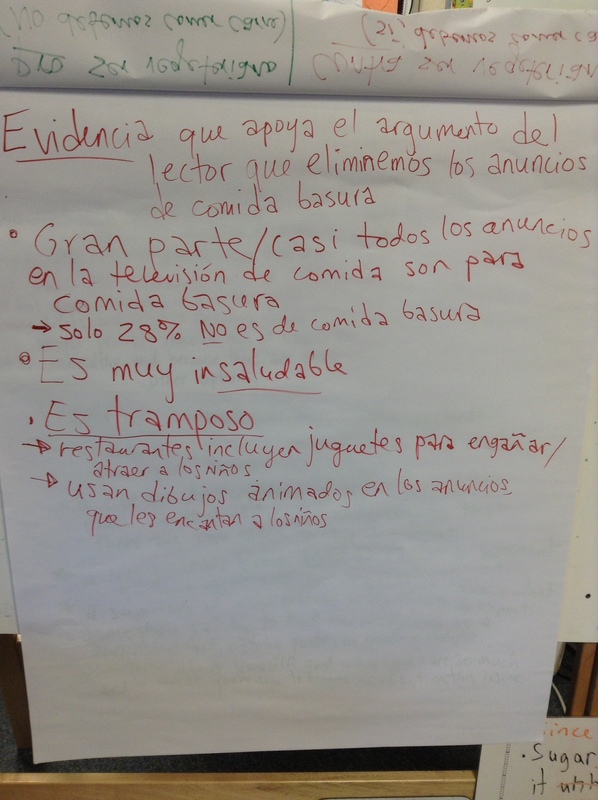 In the end, the students did demonstrate that they could have Academic Conversation without too much drama. Yet it took quite a bit to get them focused enough to do so. I guess the thing that I struggled with the most was dealing with a genre that I did not like, what could I have done to not fixate on what I did not like? I taught my micro-lesson and it was a great experience. Although I thought it was a terrible feeling during the lesson. I appreciate that we were recorded while teaching our lesson because we are our hardest critics. I usually do not get to see myself in a presentation and I always assume that I do extremely terrible talking in front of others, but it is not as bad as I think it is. However I also did notice that my ability to think up questions in the spot was difficult for me to do. It might be possible that if I pace myself I might be able to come up with clear thoughts to articulate in class. From the lesson itself I think that I could have done better if we would have integrated one activity into the other like getting to talk about words as we played the video and then writing them on the board as we went along. We also did some discussion about The Spirit Catches You and You Fall Down, one of the thoughts that I had during the discussion was about our disconnect with cultures other than our own, I think that there is little tolerances and without it we are not able to discuss and solve issues. There is great divide and disparity in how people feel about other cultures and I can see it reflected in how we interact with each other. It makes me scared for how we will present ourselves to families. We truly are afraid of knowing or admitting that we don’t know because the assumption is that we do we know everything. The thought that comes to my mind is that as adults taking college level classes we are given blank maps to fill out and for the most part we would fail to know where anything is. My point is that if we are not able to even pinpoint it on a map how can we even begin to understand others. After we had another great microteaching group presented today, we headed over to the dance studio and we did several fun activities. All of the activities we did in class today are great to pair with a lesson. The jump rope rhymes is a great way to add physical activity to a literacy lesson. The germ transmission activity could be a helpful add on to a lesson, a fun way to visually demonstrate how fast germs spread. I had a great time doing these activities and learning about how to incorporate them to our class activities. They are all great to increase physical activity in our students and also help with collaboration. What I may get stuck with though is finding ways to keep everyone engaged if children in a classroom are not able or willing to participate.